“Excellent break out sessions. I loved the fact that it was a conference with smaller sessions. It made the whole experience much more personal and meaningful. I would highly recommend it,” stated Joyce M, a teacher in the Readington School District. These were just two of the comments from educators who attended the first annual New Jersey STEM Made Simple Summit hosted by Montclair University last November. Nearly 100 educators from New Jersey and New York attended the event, which focused on a variety of STEM topics and was delivered by Eduscape, the state’s leading STEM partner. 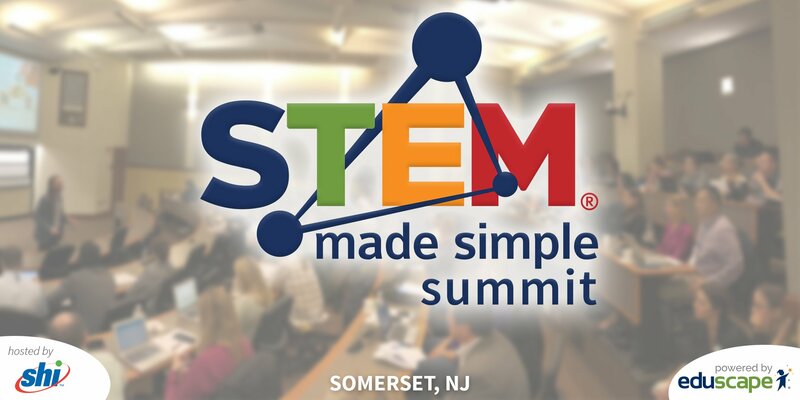 Eduscape announced they would be working with SHI to present the 2nd annual STEM Made Simple Summit in Somerset, NJ on May 22nd. The complimentary summit sponsored by SHI, will offer educators access to experience best-in-class STEM tools as well as attend break out sessions on topics including Leading & Planning STEM, Project-Based Learning, and Coding: The Language of Innovation. Dr. Christopher Caton, Director of Curriculum and Instruction for the Moon Area School District returns to open the summit for a second time. His opening presentation at the last Summit received overwhelmingly positive feedback. Dr. Caton has recently completed a doctorate in Administrative Leadership at Point Park University, and has previously served as the Coordinator for Curriculum and Literacy at the Allegheny Intermediate Unit and has been a faculty member at both Slippery Rock University and Robert Morris University. He has served as the lead writer for the development of a model curriculum in English Language Arts at the middle school level for the Pennsylvania Department of Education, and has developed presentations and tools for teacher trainings across Pennsylvania. Throughout the day, attendees are invited to explore Eduscape’s STEM Playground, where they’ll get hands-on experience with the best STEM tools available today, such as Photon Robot, Birdbrain Technologies, and micro:bit. John Henry, NJSBA’s STEAM and Sustainable Schools Specialist will lead STEAM Tank in the afternoon for more hands-on learning opportunities! STEM Educators and school leadership personnel, such as Superintendents, Principals, and Curriculum Coordinators will have an opportunity to learn how to successfully implement or enhance their STEM strategy, discover the best in class resources, and engage with their peers. If you have any questions about the event please feel free to contact us at info@eduscape.com or at 800-781-7976. This is a BYOD (Bring Your Own Device) event.